IRS Tax Lawyer Naperville: When Will You Need One? What can you expect when you have IRS tax issues? Can you handle them on your own, or is it best to hire an attorney to represent you? The IRS is not an agency you want to cross, and unfortunately, everything they deal with is very sensitive when it comes to the consequences. Even the smallest mistake could cost you time and money, and it may very well land you in jail. So, if you are facing an audit, you might be wondering if now is the right time to hire an IRS tax lawyer. We are here to clear up some of the confusion. If you would like to save both your business and yourself from a long list of possible IRS penalties, then you will want to do your research. Hiring an expert in tax representation is the absolute best choice in cases like this. A lawyer with IRS experience will understand all the ins and outs when it comes to tax laws and how to respond to issues. Chances are, they will have the expertise needed to come up with a plan for your specific case. And, it never hurts to contact Tax Law Offices for assistance with your Naperville business or personal tax difficulties. Exemption from testifying: The good news is, if you hire an attorney, then they cannot testify against you. This is called attorney-client privilege. So, if you find your tax liability case going to court, and you are working with a CPA or tax preparer, your CPA may actually testify against you, whereas your hired attorney cannot. Making the right decisions: While your CPA might be able to help you with some basic tax settlement programs, they probably don’t understand all the details of these programs and what they mean to you. In fact, tax laws and codes have a tendency to change frequently. 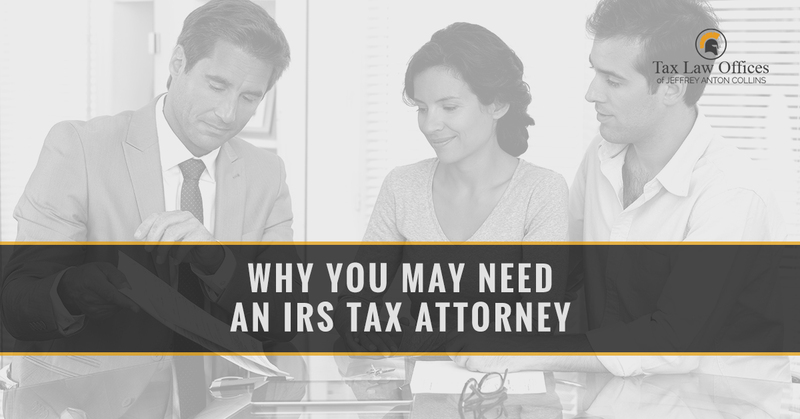 There are many programs that have been designed for troubled taxpayers, but only an experienced attorney will be able to tell you which might be the best fit for you, as well as which ones you qualify for. If you’re considering hiring an attorney to help with your taxes, that likely means that things are not going so well. We highly recommend hiring an experienced tax attorney immediately. There are quite a few deadlines the IRS will impose on you, and it can be hard to meet those since getting in contact with the IRS can be a challenge. Don’t worry – this is the perfect time to contact an attorney. Your lawyer will be able to draft any letters to the IRS in such a way that will get their attention. Also, many of the IRS lawyers out there have a way of getting in contact directly without all the hassle you would have to go through on your own. However, the number one time to call an attorney is if you have been notified of an audit of one or several of your past tax returns. This attorney will be able to reach out to the IRS for you, be present during your audit, and assist you when it comes to negotiating a settlement if need be. An experienced attorney can keep you from paying more than you should. If you have been charged with either tax evasion or fraud, these are criminal offenses that demand you hire legal help. These charges can lead to fines, interest on the tax owed, prosecution fees, and even incarceration. Once you have had any sort of formal investigation by the IRS, any information you give them could hurt your case. We highly recommend not handling these charges without an attorney who can assist you. We at Tax Law Offices want to help everyone in Naperville and the Chicago area with their tax needs. When it comes to finding an IRS tax lawyer who you can rely on, we are the number one team to call. To learn more about our services and what we can do for you, feel free to contact us today.